This week’s Creepy Crawly Wow Card is super cool! 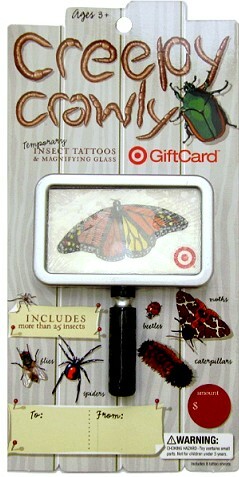 It includes more than 25 insect temporary tattoos. It also comes with a nifty magnifying glass that can be slipped into a pocket or purse in case you want to inspect something close up, like the fine print on a coupon. 😉 From a beautiful butterfly to beetles, flies and spiders, there are tattoos of all kinds of insects. And, even if creepy crawlies aren’t your favorite thing in the world- I am sure it won’t bug the winner since it will come loaded with $50 on it to spend on whatever they wish! Thanks so much for offering this fun $50 gift card! Liked TotallyTarget.com on facebook!!!! 🙂 Thanks again for this opportunity! I love Target, and I love winning things :-). Who doesn’t like bugs that come with a free $50 gc? Thanks for your great giveaways, crossing my fingers. Thank you for the wonderful giveaway as always! Will keep trying until I win one day. I know it will have. Thanks for the giveaways. I hope I win this one! Ups! I like ur web site. I am on it every day at least 8 times. Thanks for the giveaway, now pick me, lol! I already like TT on Facebook! Really cute gift card. Would love to win this one!!!!! Already LIKE Totally Target on Facebook. Thanks for another great giveaway. Would love to win this! I already like Totally Target on Facebook. I already like Totally Target on Facebook! Would love to win this gift card!! Love your site!! What a cool gift card! Hope to win this one! I love the site. It is so useful and helpful. Thanks! This giftcard is too cute!! Would love to win! I liked totally target on facebook! Yes, please! I’m always so hopeful!! Thanks! Hope I win! Thanks for everything!! Thanks for the chance to win a gift card! I like you on FB…. count me in again. Thanks! I’m totally buggy about the giveaway!! !